Nuki turns your smartphone into a smart key. Mount your Smart Lock over the existing cylinder and key. Installation takes less than 3 minutes – and is done without screws or drilling. Assign virtual keys through the Nuki app to family and friends. Keys can be set to be used once, over a period of time, or indefintely. Keep track, of who locked your door, when and whether it’s securely locked. The Nuki Smart Lock 2.0 comes with everything you love and more! Thanks to the HomeKit integration, the Nuki Smart Lock 2.0 can now be conveniently controlled via Siri. You can manage your electronic door lock via the Apple Home app and easily integrate it into your Smart Home System. The key adapter on the back has been redesigned. As a result, the Nuki Smart Lock 2.0 is now compatible with standard knob and oval cylinders. The innovative door sensor lets you know whether your front door is open or closed at all times. The Nuki app warns you if you try to lock your door while it’s open. In line with the new Nuki Fob and Nuki Keypad, the Smart Lock 2.0 has also been upgraded to Bluetooth 5. This allows for improved connection stability and increased Bluetooth range. Thanks to the new motherboard, the Nuki Smart Lock 2.0 is now compatible with the popular Smart Home standard “ZigBee”. You’ll love the perfect combination. Save 29 € if you buy a Nuki Smart Lock + Nuki Bridge in our Promo Bundle. The Nuki Smart Lock 2.0 supports Euro profile cylinders, Swiss round cylinders, knob cylinders and UK oval cylinders. Not sure if your cylinder is compatible? Take a look at our Installation Check. The entire Nuki product family is compatible with each other and can be individually combined. This also applies to future extensions. The Nuki app is available for iOS and Android devices and can be downloaded free of charge from the Apple App Store or Google Play Store. Nuki is the most flexible smart lock in Europe when it comes to integration into existing smart home systems: Nuki supports Apple HomeKit and, in addition to Siri, can also be controlled via Amazon Alexa, Google Home, and other smart assistants. The new and more powerful processor increases communication with the Smart Lock by 300%. Bluetooth 5 provides more connection stability and up to 5 times the range. The number of permissions has been doubled with the Nuki Smart Lock 2.0. Now you can assign up to 200 permissions via the Nuki app. This includes, in particular, the improved Auto Unlock Experience. The Auto Lock function is especially useful. In the Nuki app, this function allows you to set when your Smart Lock should lock the door safely behind you. At first glance, there’s no change in appearance or design. The proven hardware concept is remains the same. The Nuki Smart Lock 2.0 is also based on the elegant EOOS design line, matching the rest of the product family. However, a lot has changed on the back and under the hood. The simple and uncomplicated retrofittability is especially appreciated. That is why the Smart Lock 2.0 is also installed above the existing cylinder and key.The installation process takes less than 3 minutes and is carried out without costly conversion measures. Ever since the 1st generation of Smart Locks, security has always been a top priority. For this reason, the Nuki Smart Lock 2.0 continues to rely on the secure end-to-end encryption concept. Nuki was certified as a secure Smart Home product by the independent test institute AV-Test. Learn more. No compromises were made in terms of quality either. The Nuki Smart Lock 2.0 also stands for precise and high-quality production in Europe. The free Nuki app is available for iOS and Android devices. With the App you can control all Smart Locks that are authorized for you. Up to 200 Smart Locks can be managed in one App. If you want Nuki to lock your door seconds after you left your home simply activate the Lock ’n’ Go function feature from your smartphone app or from the button on the Smart Lock. 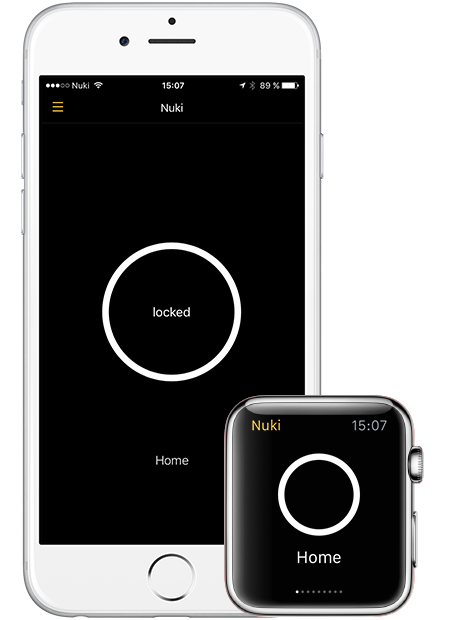 Nuki apps are also available for Apple Watch and Android Smartwatches. Lock and unlock your door right from your wrist. Extend your Smart Lock with the Nuki Bridge and enjoy full online access. Anywhere, anytime. Is the new Smart Lock 2.0 quieter than the previous version? Can the door sensor be retrofitted onto the Smart Lock (1st generation)? No, it is not possible to retrofit the door sensor on your old Smart Lock. To take full advantage of the door sensor, you need the Nuki Smart Lock 2.0 with updated firmware, increased speed and new processor. Does the door sensor need to be activated with Smart Lock 2.0? No, you don’t need to activate the door sensor. You can use your new Smart Lock 2.0 without this feature. However, the door sensor offers the advantage that you can view the status of your door (door open / closed) at any time. If you wish, the status can also be displayed in the lock log. In addition, you will be warned via the Nuki app if you try to lock your door while it is open. The setup and administration is done via the administration area in your Nuki app.